If there is a lesson in Stephen F. Cohen’s professional fortunes over the past year, it is the peril of advancing a dispassionate reading of our great country’s doings abroad. Cohen’s many pieces in The Nation on the Ukraine crisis and the consequent collapse of U.S.-Russia relations now leave him in something close to a state of siege. “My problem with this begins with the fact that… I don’t have a vested interest in one of the ‘isms,’ or ideologies,” Cohen says in this, the second part of a long interview conducted last month. The problem lies with the ideologues infesting the waters wherein Cohen swims. Terminally poisoned by Cold War consciousness, they cannot abide disinterested thought. Cohen has been mostly scholar, partly journalist, since the 1970s. His “Sovieticus” column, launched in The Nation in the 1980s, put a magazine traditionally tilted toward domestic issues among the few American publications providing consistent analysis of Russian affairs. At this point, Cohen’s Nation essays are the bedrock scholarly work to which those (few) writing against the orthodoxy turn. The first half of our exchange, last week on Salon [http://www.salon.com/2015/04/16/the_new_york_times_basically_rewrites_whatever_the_kiev_authorities_say_stephen_f_cohen_on_the_u_s_russiaukraine_history_the_media_wont_tell_you/], began with events during the past year and advanced toward the post-Soviet origins of the current crisis. In part two, Cohen completes his analysis of Vladimir Putin’s inheritance and explains how he came to focus his thinking on “lost alternatives”-outcomes that could have been but were not. Most surprising to me was the real but foregone prospect of reforming the Soviet system such that the suffering that ensued since its demise could have been averted. Stephen F. Cohen: As Russia’s leader, Putin has changed over the years, especially in foreign policy but also at home. His first impulse was toward more free-market reforms, anti-progressive taxes. He enacted a 13 percent flat tax-Steve Forbes would’ve been ecstatic, right? He offers [George W.] Bush what Clinton never really offered Yeltsin: a full partnership. And what does he do? On September 11, 2001, he called George and said, Whatever you want, we’re with you. Bush says, Well, I think we’re going to have to go to war in Afghanistan. And Putin said, I can help you. We’ve got major resources and assets in Afghanistan. I even have an army over there called the Northern Alliance. I’ll give it to you! You want overflight? It’s all yours! Q: They were? Please explain. Oh, yeah. You think they minded seeing America being brought to its knees? They’d been invaded so often; let America get a taste of it! But Putin assumes he’s achieved what Yeltsin couldn’t and that this benefits the Russian state. He has a real strategic partnership with America. Now, remember, he’s already worried about his radical Islamic problem because Russia has nearly 20 million Muslim citizens of its own. Russia sits in the East and in the West; it’s on the front lines. What does Bush give him in return? He expands NATO again and he unilaterally withdraws the United States from the Anti-Ballistic Missile Treaty, the bedrock of Russia’s nuclear security- it’s a complete betrayal. Is that how you repay somebody who’s helped you save the lives of your citizens? This is where the word “betrayal” begins to enter into the discourse. I have read many accounts of the horrors of war, including first person narratives of the Holocaust and Tim O’Brien’s “The Things They Carried.” As part of my research on the war in Ukraine, I viewed footage of civilian bodies — dead and dismembered — including women and children, from artillery shells, bombs, and shrapnel; bloated and blackened bodies of fighters scattered in fields and on the sides of roads. Yet, I never seem to become inured to it. I still wince and feel my stomach curdle, not knowing whether to weep for or rage at humanity. The first six chapters of this book provide a detailed account of Hedges’ experiences as a war correspondent, from the Balkans to the Middle East to Africa. It is graphic and disturbing in that it’s a reminder of just what depths humans are capable of plumbing. I don’t know how Hedges functions on a daily basis with the things that he has witnessed. But he seems to recognize his role as a witness in the highest sense of the word and has not only reported his observations and experiences, but has attempted to make sense of them, not only for his own sake but to provide insight and ultimately a warning about the madness of war and the folly of unleashing its dark forces. It is in the seventh chapter, “Eros and Thanatos,” where Hedges puts down his best reflections on the horrors of the previous six chapters worth of gratuitous death, destruction and moral-spiritual degradation. I certainly agree with Hedges that humans seem to have a tendency toward self-destructiveness, both on a personal and collective level. He cites Freud’s concept of thanatos, the death drive, as an approximate description of humans’ drive for self-destruction. Hedges asserts that love is its antithesis. Love representing an empathetic and symbiotic connection with another — typically another human, but I think it’s safe to say that it could include animals, God in some iteration or the natural world, anything that is beyond oneself. Love is what is needed to balance out or heal the destructive drive that war brings out. It was a bit disappointing, however, that Hedges pretty much stopped at Freud in terms of psychological thought on this. Freud’s disaffected student, Carl Jung, went much further in this area of exploration. Jung and those influenced by his thought have noted that these thanatos-related destructive behaviors, like addiction — whether to drugs, acquisitiveness or the intoxication of the power inherent in martial actions — are warped substitutes for humans’ spiritual drive for meaning and purpose that is often repressed in the modern world. Jung observed after decades of listening to patients in both the US and Europe that what they all seemed to have in common was a lack of meaning in their lives for which modern western culture — with its scientific materialism and social atomization — appeared deficient in terms of providing. 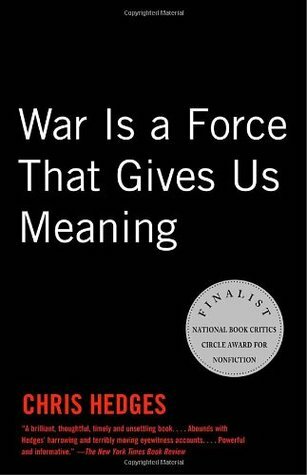 Hedges touches on this deficiency and how war can consequently serve as a source of meaning and purpose that is missing in many people’s lives, but considering the title of his book, he doesn’t dive as deeply into it as would be expected. Another area in which I have some trouble with Hedges is the assertion he makes, either implicitly or explicitly, that this destructiveness, which is most acutely reflected in war but also by drug addiction, consumerism, perverted or dehumanizing sexuality (also common in war settings), etc. has always been part of human history. It is a common fallacy repeated by many who write about war and the dark aspects of human nature or human habit. However, there is solid anthropological evidence indicating that organized warfare only cropped up around 10,000 to 13,000 years ago, roughly coinciding with agricultural settlement and its attendant forms of social organization. That is not to say there was no violence but it mostly took the form of individual homicides. What are the implications that throughout most of human history humans did not engage in war? It is a question that begs to be asked no less than the question that Hedges and so many others ask about why humans do engage in war. During the long period of no war, humans lived in small, relatively egalitarian groups. In other words, human beings did not evolve to live in large, centralized and hierarchical social structures. I would assert that they also did not evolve to believe that existence had no meaning and the universe — however narrow or broad they may have perceived it — to be nothing more than a vast machine. Humans during this period tended to be animists, to believe that all living things were infused with spirit or a sense of the sacred. This does not mean there was no killing: humans hunted animals for food and clothing and sometimes even killed other humans, but there were boundaries in place, underpinned by a sense of a connected or spiritual world view, to keep these behaviors from spiraling out of control. Humans were also dependent upon the tribe or band for survival and the threat of being expelled from the community was usually the equivalent of a death sentence. Therefore, there was a powerful incentive not to profoundly or repeatedly offend the social boundaries of that community. Paradoxically, this may provide a partial explanation as to why humans find it so difficult to go against their group, even when that group has become ethically compromised and destructive. Another psychologist-philosopher that has some insights on this is Dr. Robert Jay Lifton who has spent his career studying war crimes and those who commit them, from Communist Chinese brainwashing to Nazi doctors to Vietnam veterans. Lifton has described how relatively decent people can become war criminals due to immersion in institutions that socialize such behavior, creating what he calls the “rotten barrel.” He also describes the psychological phenomena of “doubling” — similar to what most would refer to as compartmentalizing but in an extreme manifestation. This was how doctors and others who committed or enabled atrocities at concentration camps during the day could go home and be family men at night, even at times being highly cultured individuals. Hedges describes many of the symptoms of these phenomena throughout his book and his recognition of the seductive, even addictive aspects of war is important. But he could have drawn on more schools of thought on the subject and come up with an even more comprehensive analysis. 3. Becoming Animal: An Earthly Cosmology by David Abram. Further challenging the typical western narrative that Russia is the armpit of the world and no one in their right mind could possibly want to live there, it should also be noted that a recent poll conducted by the Levada Center found only 10% of Russians thought they might enjoy living abroad while only 5% regularly thought about leaving. “Above all, we should acknowledge that the collapse of the Soviet Union was a major geopolitical disaster of the century. As for the Russian nation, it became a genuine drama. Tens of millions of our co-citizens and compatriots found themselves outside Russian territory. Moreover, the epidemic of disintegration infected Russia itself. Putin says nothing that can be construed by any sane person as a desire to rebuild an empire or take over other sovereign nations. He is discussing the conditions in Russia during the 1990’s when a small group of well-connected bureaucrats (who would become the oligarchs) seized control of what had been the Soviet Union’s major resources and industrial sectors for a pittance, taking the billions of dollars they made out of the country while the population lost their life savings, experienced prolonged periods receiving no salaries or pensions, went hungry and suffered due to skyrocketing crime and a major mortality crisis. He was talking about how the country was gradually getting back on its feet after the decade under Yeltsin’s rule that put Russia literally on the verge of being a failed state. The European Union, led by Germany, tried to pressure Ukrainian president Viktor Yanukovich to sign an Association agreement. Upon review of how the agreement would actually affect his country economically – already the poorest in Europe – including austerity measures, renunciation of their significant trade with Russia and the supplanting of Ukraine’s native oligarchs, Yanukovich balked and opted to go with a Russian deal comprised of a $15 billion loan and reduced gas rates. As it turns out, the West was not in fact offering Ukraine free trade or even visa-free travel but a self-serving deal that had little to no benefit to Ukraine. Most people in Yanukovich’s place would have done the same. 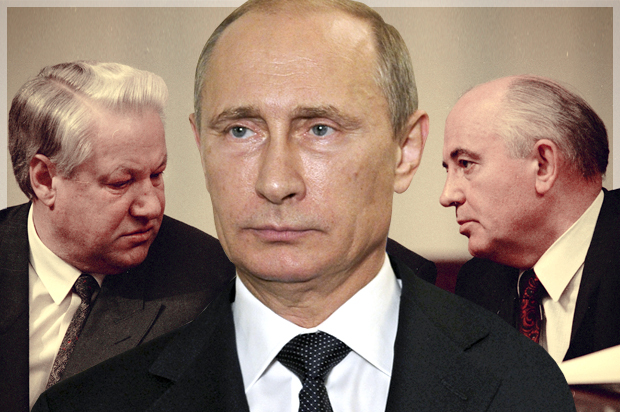 Throughout the period of negotiating this association agreement, Russia requested three way talks to avert problems. Of course, Russia wanted to protect its own economic and trade interests, but it also had an interest in preventing friction or instability on its border. They were basically told by the West to drop dead. According to an independent investigation by Germany’s ARD TV into the events surrounding the ouster of the democratically elected president, specifically the violence on the Maidan, found that sniper shots, starting on February 20th, which resulted in almost 100 deaths came primarily from buildings controlled by the Maidan protesters. A more in-depth forensic investigation was conducted by Ukrainian-Canadian academic Ivan Katchanovski, PhD. His conclusions supported the ARD report. This is all consistent with Estonian Foreign Minister Urmas Paet’s account to then European High Commissioner Catherine Ashton in an intercepted phone call posted on February 26, 2014, wherein he stated that his sources, including Dr. Olga Bolgomets – who was an ardent supporter of the original Maidan protests – reported evidence that the snipers were Maidan protesters. Paet also reported that members of the Ukrainian parliament had been beaten and threatened during the period in question. Prior to the sniper violence and the ouster of Yanukovich, State Department official Victoria Nuland and US ambassador Geoffrey Pyatt were caught with their pants down in an intercepted phone call posted on February 6th wherein they are discussing how to “glue this thing” and who will be the best person to lead a post-Yanukovich Ukraine, declaring “Yats is the guy.” She also famously disparaged the EU’s less aggressive approach to engineering a zero-sum position for Ukraine with respect to its relations with the West and Russia. Thus, there is overwhelming evidence, typically ignored by the western mainstream media, that Yanukovich’s ousting was actually the result of a violent and planned coup. Independent video journalist Patrick Lancaster, who has been reporting from the Donbas since spring of 2014, stated that most of the fighters he has encountered on both sides are Ukrainian. British Russia scholar Paul Robinson has estimated that 90% of the fighters in the Donbas are Ukrainian. Furthermore, he states that the original rebellion constituted regular citizens who took control of local government buildings in response to the startling events coming out of post-coup Kiev where laws were introduced seeking to delegitimize the Russian language, neo-Nazis were given posts in the Interior and Education departments and many acts of violence were committed against members of the Communist Party and the Party of Regions. When Robinson asked a Maidan protester why this political protest had led to a more violent and divisive result than the Orange Revolution in 2004, the protester admitted that this time they didn’t care what the Crimeans or the residents of the Donbas wanted. So the divisiveness was not initiated by Russia or the ethnic Russian population of Ukraine, but by a portion of the Maidan protesters who basically believed a whole segment of their country should – to put it delicately – kiss off. 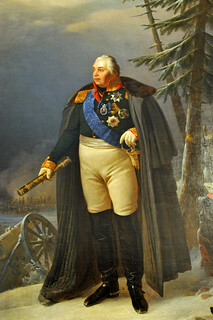 Although Russia has provided some arms and allowed Russian volunteers to cross the border freely, Robinson points out that Moscow has actually had a moderating influence on the rebels by facilitating the replacement of the original military leaders (Igor Strelkov and Alexander Borodai) that supported a quixotic quest for independence. An independent Donbas that would be economically unviable and would provide no counterweight to a hostile and extremist government in Kiev is not in Moscow’s interests.